The key to profitable rentals is attracting the best tenants, and having a successful property showing is instrumental to achieving that goal. The ideal tenant is someone who will care for the property. That means landlords need to find applicants who are picky about where they want to live. These tenants want a rental home that is well-kept. Prospective tenants must like the property, but that’s not all. They also must feel confident that the landlord is a professional. The secret to success, once you’ve found the right applicants, is presenting the right image. On the day of the scheduled showing, plan to arrive a few minutes early to check the property before the rental applicant arrives. 1. One trick that experienced property managers have learned is that if the unit smells clean, it will look cleaner. Unfortunately, rental units can develop stale odours in between showings. Avoid this problem by carrying an air freshener. Sprays are easy, but the candle variety can add ambiance to the room. Another option is to bring along a scented multipurpose cleaner, or diluted vinegar in a spray bottle. Wipe it over dusty counters or randomly throughout the unit to spread the “clean” fragrance and add some shine. The third option is to store a coffee maker and brew a pot just before the applicants arrive. This creates a pleasant, “homey” feeling. 2. Carry a portable vacuum to clean up dust or tiny objects — like dead spiders — that could upset a finicky prospect. 3. A microfiber cloth is handy to use on dust or to polish away finger prints. 4. Keep a spare light bulb or two on hand in case one has burned out. This is particularly important for outdoor lighting, because good applicants highly value security. 5. Spare batteries for smoke detectors. The last thing a landlord wants during a tour is the annoying chirping sound from a neglected smoke detector. 6. Have a small trash bag to pick up items like overlooked coffee cups from the last showing, or debris left behind by contractors. 7. Often tenants ask, “Will my furniture fit here?” Carry a measuring tape to calm any concerns. 8. Don’t forget to bring along the rental application. Bring one for each adult occupant. 9. Carry a copy of the leasing rules, or a copy of the lease agreement for the tenant to review. NOTE: Don’t allow the applicant to sign the lease agreement on the spot, before you have a chance to run tenant screening reports. You may later regret your choice of tenants. 10. 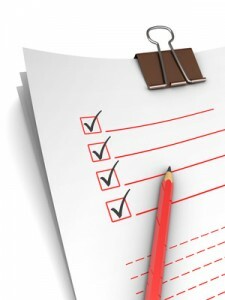 Maintain a list of the answers to the most commonly-asked questions from prospects. This could include a floor plan with room measurements, or information about the nearest public transportation. This list likely will expand as new prospects raise questions. BONUS TIP: Don’t assume that tenants can find your contact information again. Invest in some business cards to hand out to prospects, or to distribute at open houses. The point about not signing a tenancy agreement “on the spot” is critical. Once a tenancy agreement is signed, if you change your mind, the “tenants” could get an Order of Possession, forcing you to allow them to move in. On the other hand, once you are sure you want the applicants, sign the tenancy agreement as soon as possible, as they are your tenants from that point and would be liable for at least one month’s rent if they change their minds. Aww man !! We have been landlords for years, but this list really opened my eyes as to how to attract better tenants ! I am printing this out and pinning to my bulletin board for the next rental ! I would also add — do a pre-walkthrough and fix what it obvious (lightbulbs, blinds etc.) and be aware of what may be wrong before prospective tenants bring it up. Thanks for this great list.. Thanks for posting Tim R. Glad to hear that you got something from this article. Chris our Writer…provides excellent guidance and information for all of us. The point that I always make at seminars is: Treat your rental business like a “business.” Act like a professional, do what you would expect someone in your shoes would do. TVS/ATS have a lot of competition out there, we like to do something different like these articles for instance to make us stand-out from the competition. We also like to provide the best services, like you should do as a successful landlord. In most instances it only takes a little extra effort. A TVS Florida employee who just bought his own house, had many complaints about his landlords over the years. His biggest complaint? The landlord doesn’t care about us, he/she is only concerned that the rent payment is made on time. There were never any site inspections to determine if the rental was in good repair and also to determine if the tenants were happy! Bottom line is…take an interest in your rental business. It benefits everyone. The cost to replace an unhappy tenant is several thousand dollars. so why not keep the current tenant happy?